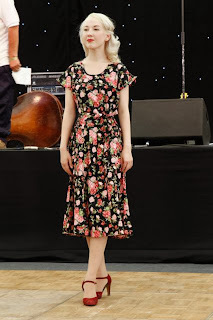 The Secret Dreamworld of a Vintage Girl: Dancing and Dreams Come True at the War and Peace Revival! Dancing and Dreams Come True at the War and Peace Revival! To be honest, I felt a little out of place at the Revival. When you're surrounded by people who have taken a long time to choose an outfit you tend to feel a little awkward. I hadn't realised that the Revival would be so popular! 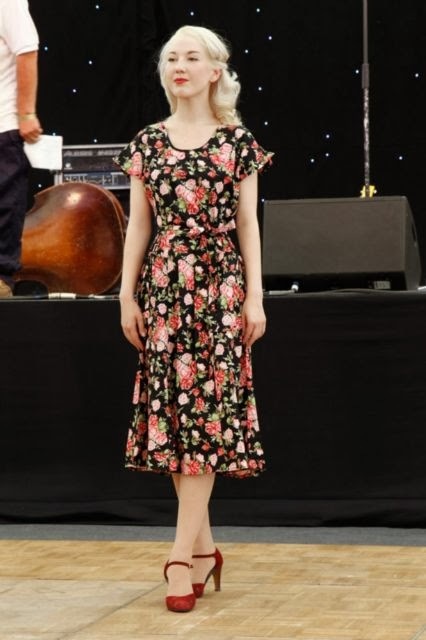 I met up with my contact for the day, Shona Van Beers of Heyday Vintage who is absolutely lovely, and was whisked off to the neighbouring stall "Dress Circle Vintage" to find me two outfits to parade at the fashion show. 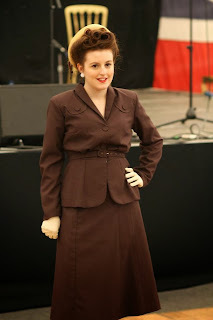 This was my first "debut" as a vintage model and I think it went well. I chose a beautiful homemade 1940s summer suit for the "War" part and a gorgeous 1950s dress for the "Peace" part. I then met with my fellow models, including Burlesque artiste Rosy Apples, her cute little Teacup Yorkie Hattie, and Tori and Laura. We had lots of pictures taken and I will be posting them once they have been uploaded. We shared a dressing room in the Victory Marquee with a Californian act, The Satin Dollz who were also really friendly. Once the fashion show was over, I took the opportunity to walk around the stands and stalls at the event. It was extremely hot and after a quick refreshing glass of Crabbies Ginger Beer I returned to the Victory Marquee to watch the afternoon acts perform. It turned out that Rosy's boyfriend Adam was performing Dean Martin songs and as someone who loves swing and big band, this was the perfect way to spend the afternoon. Adam is extremely funny and very witty at playing to the audience, if you get the opportunity to see him perform, it's definitely worth it!!! 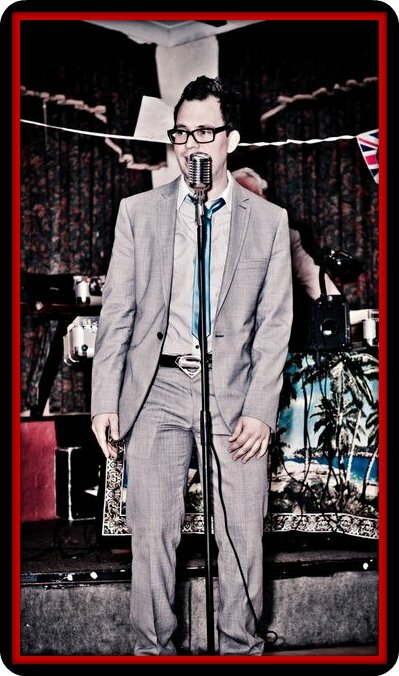 Mr Adam Hoffman, Singer and All Round Entertainer! Then came Miss Luna Nightingale, who sings the hits of the likes of Billie Holiday (complete with fake cigarette in true jazz style). This girl has an astounding range, and blew me away with her vocals! I also got to meet all the acts in person including Mother and Daughter duo Sincerely Yours, from Staffordshire, who also gave a brilliant performance of 1940s hits. "Sincerely Yours" Copyright Colin Baker. It was then that I realised my yearning to get back on stage. As a former musical theatre student, the performance element never really leaves you, and being there made me realise how much I missed it. Luna gave me some sound advice about what to do if I wanted to do something similar and with a little encouragement from both her and Adam, I agreed to perform at the Jazz Bar on Friday. We adjourned to the said Jazz Bar and Adam performed a few more tracks whilst I danced with a real American, who was dressed in full 1940s army uniform! At which point all the old quips about the "Yanks" came out, and thankfully all were taken in good humour! With the day sadly drawing to a close, I bade my goodbyes and headed home, with a promise that I would return on Friday. On the Friday I got up bright and early, dressed in my finest California Cottons dress with pink ribbon and floral print and took the train once more from London Bridge with seconds to spare. The journey was very pleasant and I took the opportunity to make the most of the empty carriages by doing vocal exercises to ensure that my voice would be in condition for singing. The fashion show passed quickly and even standing on that stage I could feel panic setting in. I would be singing in front of people again, why didn't I feel happy? I can't tell you how nervous I was when I stepped up onto that podium and sang those three tracks. I started, quite literally, with shaking legs and a matching vocal for the classic Dusty Springfield hit "I Only Want to Be With You", followed by "Smile" by Nat King Cole and my personal best, "The White Cliffs of Dover" by Vera Lynn. This one received the most applause and according to Luna, it was the best of the three. I was then approached by a gentleman who had been watching who said "Thank you for singing that, my wife loves that song," which brought a smile to my face and a tear to my eye. I watched the professionals doing their routines, and met with Laura, one of Luna's friends who later joined me on a shopping trip around the vintage stalls and watched me make a purchase of a pair of cute unworn 1950s plaid Capri pants! The whole event was an amazing experience, and has given me the confidence to pursue my ambitions. Overall, a thoroughly perfect way to spend two days!!! Now off to book tickets to "War and Peace Revival, 2014..."